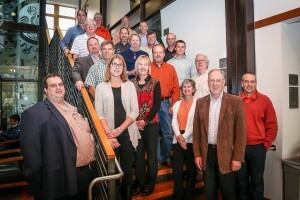 School Head Jason Weiss (left front), alumnus Tom Skoro (second from right, front), and members of the Industry Advisory Board (IAB). Dean Scott Ashford recognizes alumnus Tom Skoro for his upcoming alumni award at the IAB reception on Friday, Oct. 23, 2015. 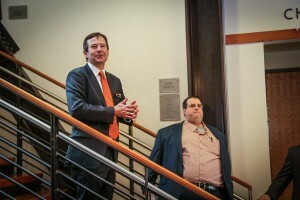 School Head Jason Weiss and Tom Skoro. Tom Skoro and Jay McCrae at the IAB reception. 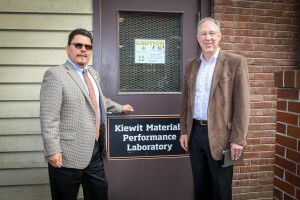 Professor David Trejo and CCE Tom Skoro at the Kiewit Materials Performance Laboratory. As part of its Homecoming festivities, the Oregon State University Alumni Association will recognize CCE alumnus Tom Skoro as an alumni fellow on October 23. Skoro was one of six alumni to receive the distinguished honor. After graduating from Oregon State in 1981 with a bachelor’s in construction engineering management, Skoro worked continuously in the heavy construction industry, primarily with Kiewit Construction Group. Inc. He has varied construction experience but has specialized in bridge construction, including high-tech segmental construction. Skoro resides in Vancouver, Wash., and is a senior vice president of Kiewit Corporation. The OSUAA established the alumni fellows program in 1988 to help OSU colleges recognize their eminent alumni. Honorees have distinguished themselves in their professions and communities. After earning her Ph.D. in civil engineering from North Carolina State University, Assistant Professor Ingrid Arocho joined the School of Civil and Construction Engineering in January 2015. Prior to OSU, Arocho conducted research on construction site emissions from diesel powered equipment. In her work, she studied how contractors can use different equipment combinations and project schedules to reduce total emissions and environmental impact from construction projects. Currently, Arocho is conducting safety research with Professor Chris Lee on transportation construction-related accidents. In their work, Arocho and Lee are using the method of fault tree analysis to understand how accidents occur and to identify the best ways to prevent them. 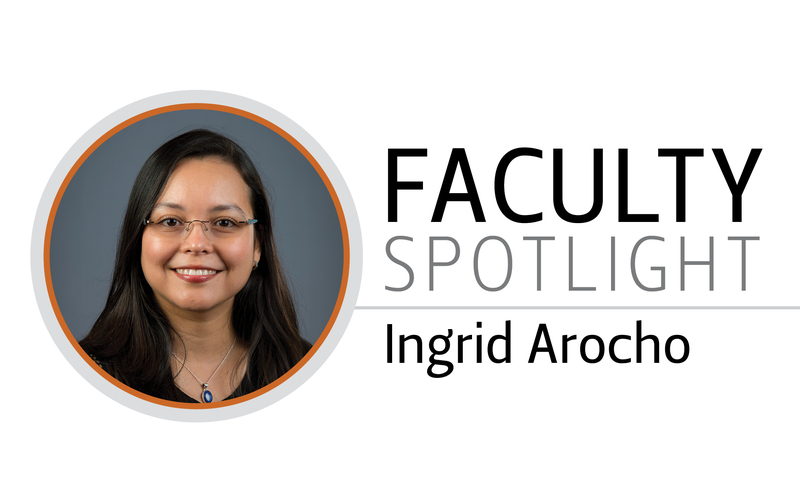 Arocho teaches Project Management for Construction CEM 443/543 and is a member of the Transportation Research Board. 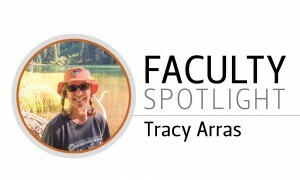 Senior Lecturer Tracy Arras joined the School of Civil and Construction Engineering in 2011 and today serves as an ESTEM@OSU Action Research Fellow. Arras’ research is centered on strengthening problem-based learning in undergraduate education, which she applies in all of her courses but the ESTEM@OSU fellowship is primarily focused on the class Engineering Graphics and Design CCE 201. For many students in CCE 201, the course is the first opportunity to apply their engineering training to a real-world problem. For their term project, students work in teams to retrofit a city block for the implementation of greenwater infrastructure devices. Throughout the course, the teams design and develop their proposal which includes a thorough cover letter that describes their proposed plan as well as set of engineering drawings, known as a sheet set. “For their professional development, I recommend students participate in as many hands-on, experiential learning opportunities that they can and develop a portfolio of their projects,” said Arras. Arras’ technical interests are principally in the area of geographical information systems (GIS), water resources and the integration of GIS for water resource applications. Her technical interests also include the development of innovative and effective pedagogic approaches to engage freshman and sophomore students. 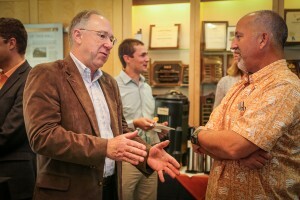 Arras holds a Ph.D. in water resources engineering from OSU and previously served as an associate professor in the School of Engineering at the University of Alaska Anchorage. Guests listen to Great Builders in the Austin Auditorium of the Lasells Stewart Center on the Oregon State campus. Paul Giroux presents his talk, Great Builders, on Monday, Oct. 5. 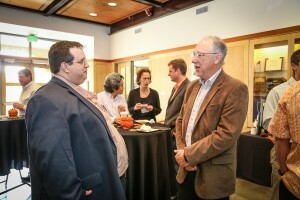 Paul Giroux meets with CCE faculty and alumni following the lecture.